Everett Collection ‘I’m mad as hell and I’m not going to take it anymore.’ Peter Finch in Network, 1976. Stars: Faye Dunaway, William Holden, Peter Finch, Robert Duvall, Ned Beatty, Beatrice Straight. Arthur Jensen (Ned Beatty), president of a conglomerate so vast that its name (like Tenneco) conveys no impression of its interests, projects his voice through a large, empty barrel to inform us that the human race is rapidly being replaced by humanoids. Perhaps that is why Sidney Lumet, director of Network, has encouraged his cast to perform as though everything they know about being men and women they have learned at second hand. They may not be robots, but they sure as hell are hams. And Max Schumacher (William Holden), a TV news chief who can remember all the way back to the golden age of Ed Murrow, keeps complaining that his life is shaping up into a situation soaper. So we mustn’t complain that Paddy Chayefsky’s screenplay is a primitive handkerchief wringer that would have opened on the neighborhood circuits but for the fact of its extreme boldness. I turn, then, to that. 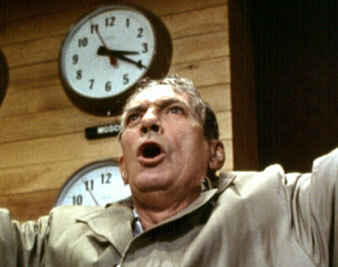 When the film opens, Howard Beale (Peter Finch) has been told that he is through as anchorman of the evening news show because his rating has fallen to a point deemed unsatisfactory by Frank Hackett (Robert Duvall), hatchetman in residence for “Mr.” Jensen, whose enigmatic holding company has recently “acquired” ‘the network. That evening, Beale announces on the air that he has been fired, that life has accordingly turned to ashes on his lips and that, on camera the following night, he will blow out his brains. Having sobered up—I hate to say it, but Beale has been hitting the bottle—he expresses penitence and begs to go on one last time to apologize for his foolish flight of melodrama. It is granted, but instead of apologizing, Beale lashes out at all we hold dear in capitalist society, making liberal use of the words quoted above. Sensation! And a very high rating. Diana Christensen (Faye Dunaway), a representative of the new ruthless generation at the network, senses that the public has become an army of jackals, hungry for the bloody meat of public disaster. She demands to be given control of the news program, which she will convert into a witches’ coven, with Beale as the presiding warlock. And poor Beale, who is by now hearing voices and trotting about town in his pajamas, turns “news” into the biggest sensation on the air—an easy rival of Ms. Christensen’s other brainstorm, a series of specials in which the Ecumenical Liberation Army really shoots down bank clerks and other oppressors of the poor and underprivileged. But then the quite gaga Jensen (derangement is the leitmotif of this film) gives Beale that pep talk through a barrel and the bemused commentator begins preaching the happy humanoid gospel (eat, drink, and be sedated) of the multinational church. Unhappily, the public does not cotton to the notion that it should be glad to surrender whatever soul it has, and Beale’s rating again begins to slide. Hackett says the revivalist must go; no, says Jensen, he must stay and to hell with the ratings (God blasphemes). Frustrated and inflamed, the hatchetman decides that Beale must be murdered, and Christensen, exceedingly high on audience projections, springs forward to announce that the Ecumenicals will carry out “the contract,” live and coast to coast. So they do—and as someone remarks at the end, it is the first time in TV history that a man has been killed for his lousy rating. There is a subplot involving Schumacher and Christensen, but it is pure, soap and beneath comment. So is this a slashing comment on network television and therefore exceedingly bold? Not by a country mile. There is plenty wrong with television, plenty to satirize. But Network prudently misses the point, dishing up an outrageous razzle-dazzle stew that will ruffle no network feathers and delight popular audience that enjoys being titillated by improbable threats. The trouble with network broadcasting, and particularly with news broadcasting, is not that it is engaged in a network war so savage that it will put criminals and lunatics on camera to steal percentage points from the competitors. The trouble is that it is unenterprising, homogenized, superficial and biased toward information that can be conveyed in pictures. TV is not turning human beings into ersatz creatures competent only to devour consumer goods (that is a facile complaint). What it does, because it lacks the imagination and stimulus to do better, is feed its chronic viewers with a diet of information so inadequate that they cannot perform the basic chores of citizenship—that is, act in their own best interest. Down the centuries, the evolution of the means of communication has always been in the direction of providing a larger audience with more information. The medieval scribes did so, Gutenberg did so; so did Mergenthaler and the high-speed rotary presses. But television, a retrogressive mutation, is providing the very largest audience in history with significantly less information than its fathers and grandfathers received. Very possibly television is not to blame. Perhaps it is an ingenious toy, not worth more than passing attention from adult minds. Network has Beale inspiring his viewers to throw up their windows, from coast to coast, and scream into the night, “I’m damned mad. And I won’t take it any more!” Revolt of the masses? Nonsense. The real revolt would be for the public to turn off the set, pick up a newspaper (magazine, book, letter from a Congressman) and start hunting for what it wants to know, whether or not the information can be compressed into a thirty-second camera shot. Of course, a film that worked up that notion wouldn’t require the use of naughty words or an indulgent view of mental collapse and unprincipled violence, but it just could jolt the people into realizing that most television is a dreary waste of their one-time-only lives. That would really be bold, for the networks, which don’t mind being called wicked, would hate to be exposed as boring.